Yet another dismal, rainy day in New York was about to come to a very satisfactory conclusion. First, when I stopped at the box office of Manhattan’s sleek Little Shubert Theatre to pick up our tickets for the final preview of Lucky Guy, I discovered the excellent seats would be second row Orchestra on the aisle. If that wasn’t enough happiness, my friend and I then enjoyed an elegant pre-theatre dinner of Duck Confit at the chic Chez Josephine restaurant right next door to the theater. But that was only the beginning of the evening’s delights. It was time at last for Lucky Guy, which as I write these lines is celebrating the official opening night of a 12-week run scheduled to continue through July 24th. I’m betting it will be extended. Looking for serious drama? Don’t go near this show. 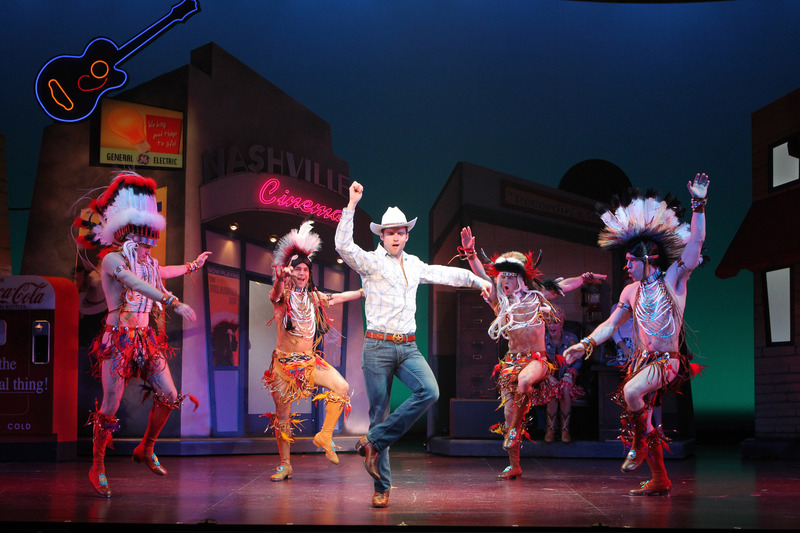 But if you are looking for a musical with a witty script, great tunes, solid singing, eye-popping costumes, dazzling dancing, and an eye-candy cast of gorgeous performers (with a generous dose of hilarious camp on the side), then you are in for a rollicking good time at Lucky Guy. With book, music, and lyrics by the show’s director, Willard Beckman, the production has been percolating for about three decades prior to now exploding on the New York stage. 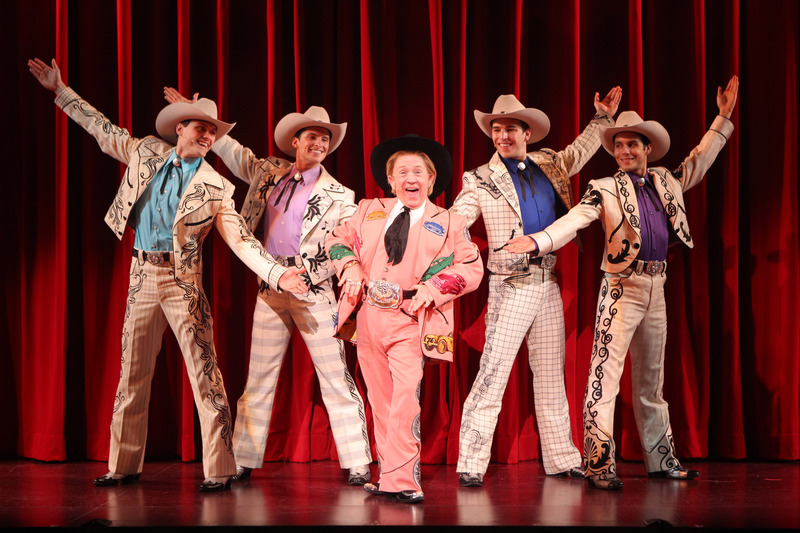 Anchoring much of the fun is the deliciously nutty performance of comical Leslie Jordan as the conniving, mincing & flamboyant Nashville car salesman, Big Al Wright. Big Al is fond of selling cars he claims were previously owned by major recording artists, and he has slogans for all occasions to promote his dealership’s “…five convenient locations in Nashville.” How about, “If you want a used car used by a big star,” or “Thrills, chills & Coupe de Villes?” A short, dumpy, and limp-wristed curmudgeon, Al prances about in a hilarious peach leisure suit covered with colorfully sequined automotive designs. 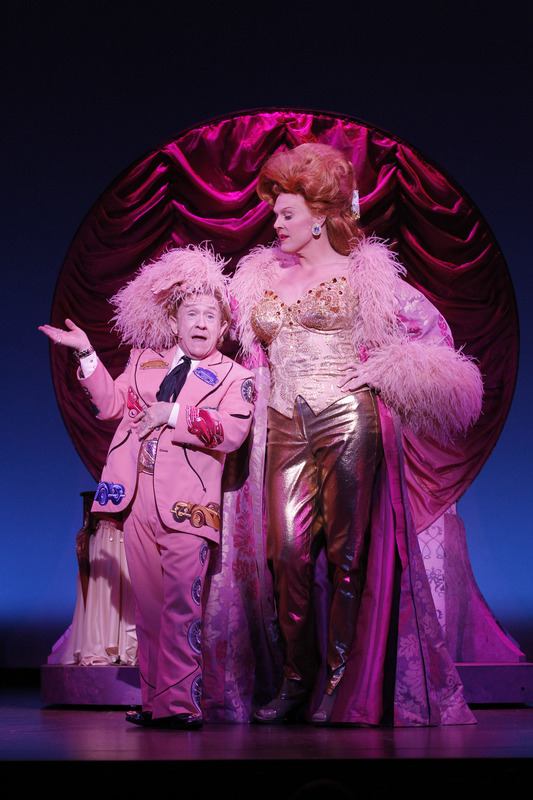 Accessorized with plenty of gaudy jewelry, it was just one of the show’s countless and deliciously outlandish costumes from William Ivey Long, and paired nicely with some uproarious wigs from designer, Paul Huntley. The action is nicely framed by Rob Bissinger’s neon-Nashville set design. The story catches fire when a hunky young country boy/songwriter named Billy Ray (the very handsome Kyle Dean Massey) arrives in town having won a songwriting contest and recording contract for a tune titled (you guessed it), “Lucky Guy.” But Mr. Massey does not get by on his chiseled lean physique and drop-dead good looks alone. 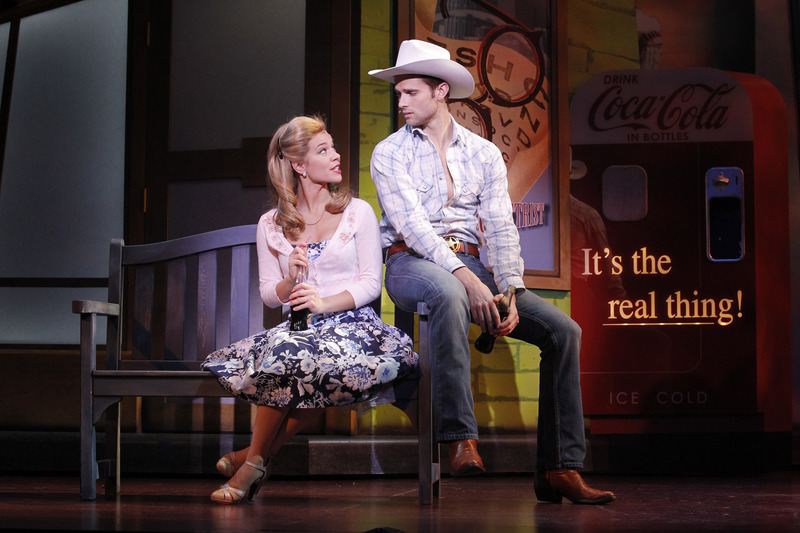 He sings with All-American Boy gusto and can dance up a storm—country style. In that effort he is energetically joined by the Buckaroos, four equally handsome lads who look like they could be Billy Ray’s brothers and would easily pass as cover models for Men’s Health magazine. Bergmann, Xavier Cano, Wes Hart & Joshua Woodie. (Choreographer, A.C. Ciulla). Right out of the box, and with flashy western suits for the whirling opening number, “Nashville,” these guys light up the stage for one showstopper after another, and boy do they have campy nonsense down to a science. Meanwhile, a pretty studio secretary named Wanda (Savannah Wise) quickly catches Billy’s eye, and he recalls his father’s sage advice: “It’s not what you’ve got in life, it’s who you’ve got to share it with.” Wanda’s girlfriend, Chicky (Jenn Colella), is a sassy hairstylist at the drive-thru Wigateria, and with quite a wig of her own she keeps the mood light with the song, “I’m Doin’ Hair Today.” Billy and Wanda join Chicky and the Buckaroos for a vibrant “Osage County Line” number that looks like a fiery Indian war dance with scanty feathered costumes to match. It doesn’t take long for us to realize that Big Al and his brother are up to no good with a plan to steal Billy’s hit tune to restart the career of fading Nashville diva, Miss Jeannie Jeannine, hilariously played with over-the-top camp by Varla Jean Merman (a.k.a. drag dynamo, Jeffery Roberson). For her first sensational number, “Blue Jean Blues,” the very statuesque Merman rises up magically from beneath center stage with a widespread and sparkling blue dress giving her the look of a kind of grand wedding cake with her on top. 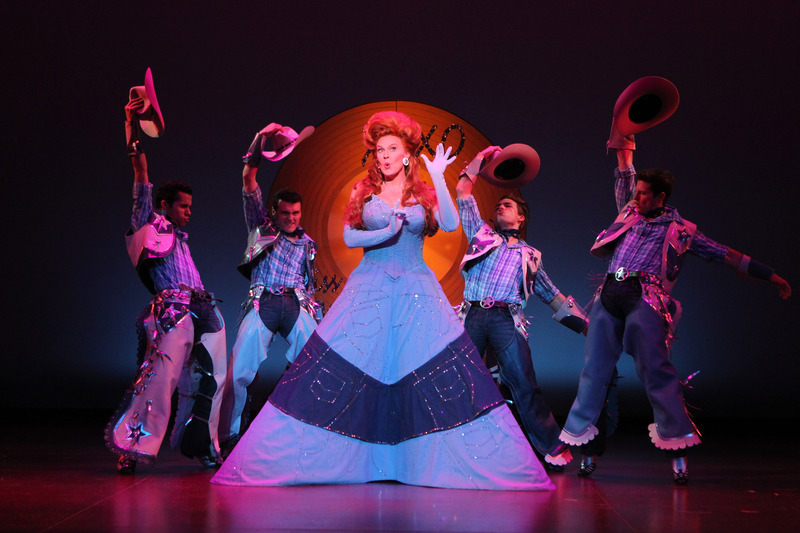 costume glory is her glitzy trademark in songs like “Queen of Country Music,” as the Buckaroos prance about looking like Elvis look-alikes in the court of Louis XIV. Amusing wisecracks and double entendres abound in her sassy exchanges with Big Al. The lovely Miss Wise shows her natural appeal and vocal skill as she joins Billy in a perky duet of “Needle in a Haystack,” just one of the many catchy and infectious tunes in the show that are skillfully guided by musical director, Paul Staroba and the fine pit orchestra. 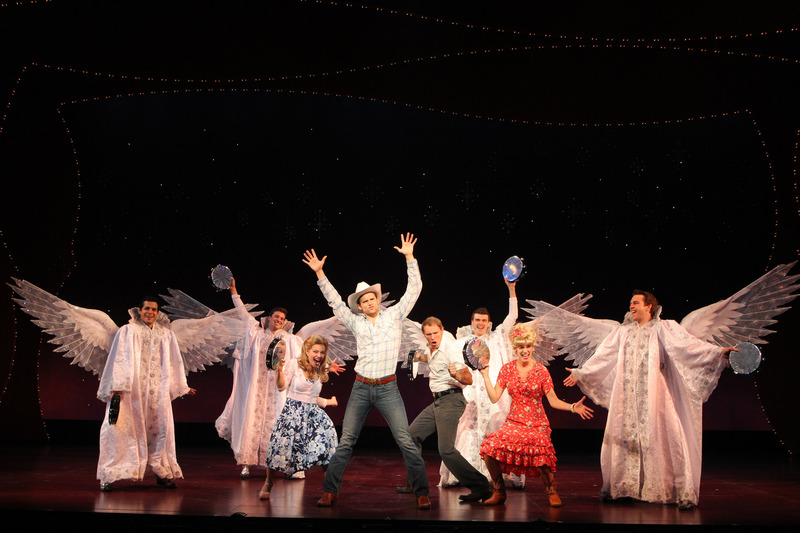 Then spectacle closes Act One with a dazzling, “Do What You Can Do” showstopper that casts our Buckaroos as angels taking flight with holographic tambourines in hand while the audience beamed with satisfaction. Spectacle continues in Act Two with the eye-popping “Louis From Kahului” number from Jeannie and the Buckaroos that runs the music and dance gamut from Hawaiian to Hoe-Down with our daring diva looking like a jewel-bedecked Carmen Miranda as the lusty lads gyrate around her. There’s a tender, “Rememberin’ You,” from Billy and Jeannie, a zesty “Trailer Park Romance,” from Jeannie and the Buckaroos, and some lilting soft-shoe work from G.C. & Chicky. Jeannie finally reveals a long-kept secret, and Merman brings sweet longing to the song, “My Ole Friend.” There is further satisfying sentiment as Billy and Wanda romantically rework “Lucky Guy,” before the final number titled, “The Big Finale.” It does not disappoint. I’m reminded of something Billy said to Jeannie earlier in the show: “You’ve given me a night I’m never gonna forget.” That works for me! LUCKY GUY continues through July 24th at New York’s Little Shubert Theatre, 422 West 42nd St., NYC with performances Wednesday-Friday @ 8pm; Saturday at 2 & 8pm; Sunday at 2 & 7:30pm. Tickets are $44.00-$86.50 with Premium seating available. Tickets can be purchased through TeleCharge.com / 212-239-6200 or at the theatre box office from 12-6 pm. Join LUCKY GUY online at http://www.Luckyguythemusical.com. This entry was posted in Broadway, Miscellaneous Reviews, Theater Reviews and tagged Broadway, Entertainment, music, musicals, Reviews, theatre. Bookmark the permalink.